Where can I buy a red-and-white checkerboard floor? While I know of at least three suppliers of black-and-white checkerboard flooring that comes in big, wide one-piece vinyl sheets, the only way I know to do red-and-white checkerboard is to use individual tiles. 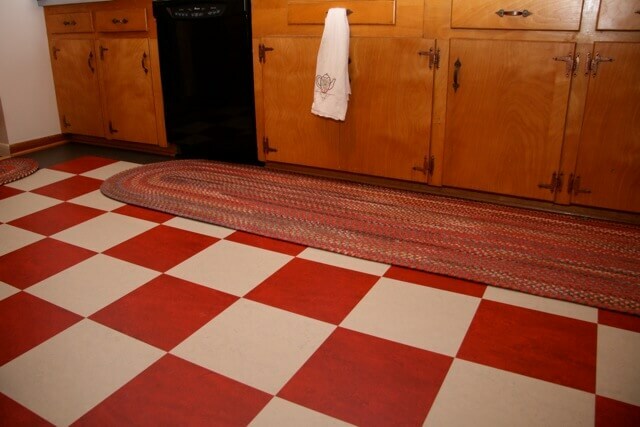 In the photo above, reader Donna used Marmoleum tile — linoleum — to create the red-and-white checker board kitchen floor in her delightful 1965 kitchen. She edged it in charcoal linoleum. 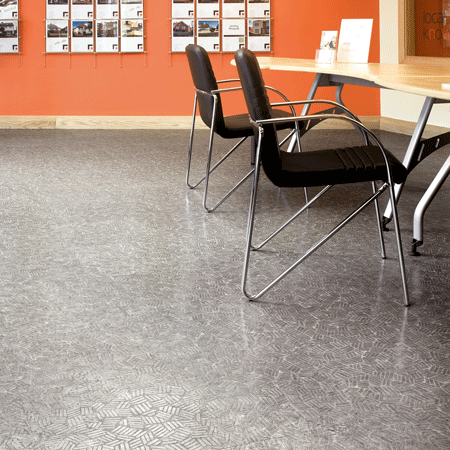 A second choice for resilient squares is vinyl composite tile from places like Armstrong — a very inexpensive solution. And, you have actual ceramic tile, arranged in checkerboards, as an option, too. One of the advantages of the black-and-white checkerboards on wide vinyl sheets is that, among the options, there are a variety of different sized squares. With the linoleum or vinyl tiles required for red-and-white, you are limited to 12″ squares, as far as I know. Back in the day, linoleum and vinyl squares were most often 9″, as far as I know. 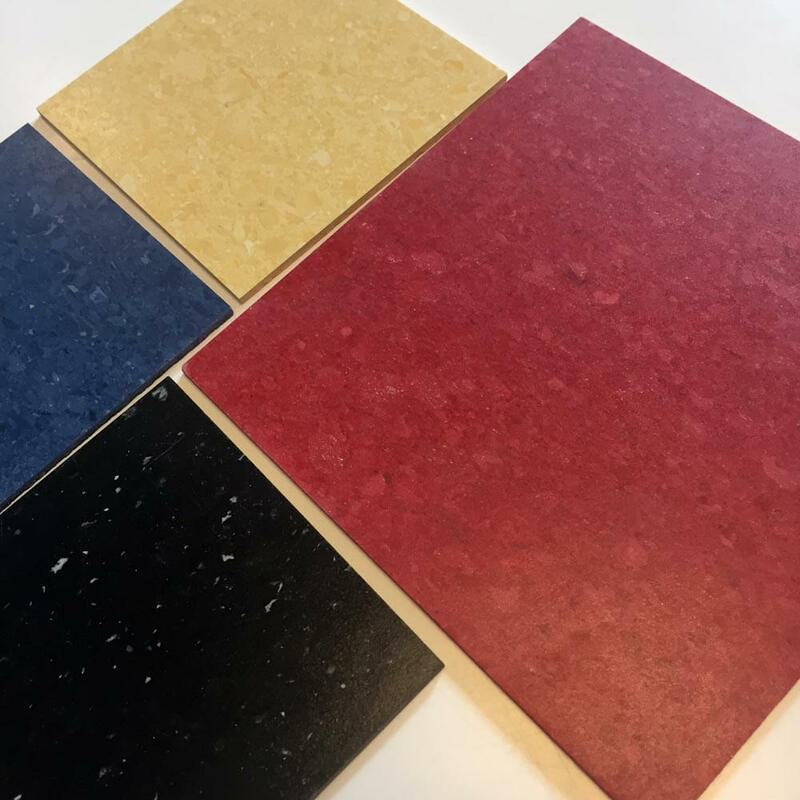 You can get this look for resilient tiles — but talk about work, I think you have to buy sheet flooring, then take it to a special water-cutting company to have it cut neatly into smaller squares. Glitter vinyl floor tile — we found a source! Be careful if you are going the vinyl sheet route. I just finished my new kitchen done in sage green and black and white check. My vinyl SHEET flooring is now rippling up and showing seams of the subfloor below. The installer said that the vinyl sheet goods will do that on any floor. Kinda sounds like a “SPIN” to me. He wants me to change my floor pattern and that will ruin my whole kitchen. I’m not researching where to get black and white check tiles instead of sheet goods. GOOD LUCK TO EVERYONE!!! doing a retro flip house. vct too labor intensive and was thinking gray and white vinyl sheet instead of black and white . a little softer i thought. anyone seen colored check vinyl besides black??? Looking for the red and white,can’t seem to find it trying to put 1940 Bungalow as it might have looked then.I would settle for the red with different colored splatters or with just the white splattered.I would love the floor to be shiny and most of the tiles are a matte finish.Do you think I am asking for to much. I don’t know of any way to do it except by piecing together red and white VCT or linoleum tiles. To get shiny, you’ll may need to polish the floors – check manufacturers’ recommendations.